Each year, approximately 17 percent of road construction work zone fatalities nationwide are pedestrians. At special risk are the visually impaired, who rely on walking and public transportation to get around. A major challenge for them is crossing the street — which is even more difficult if an intersection is torn up. MnDOT has invested significant effort to accommodate pedestrians, particularly those with disabilities, in temporary traffic control situations. This includes requiring temporary curb ramps and alternative routes when a sidewalk is closed. Researchers, funded by MnDOT, have now developed a cell phone application to guide blind pedestrians around a work-zone. 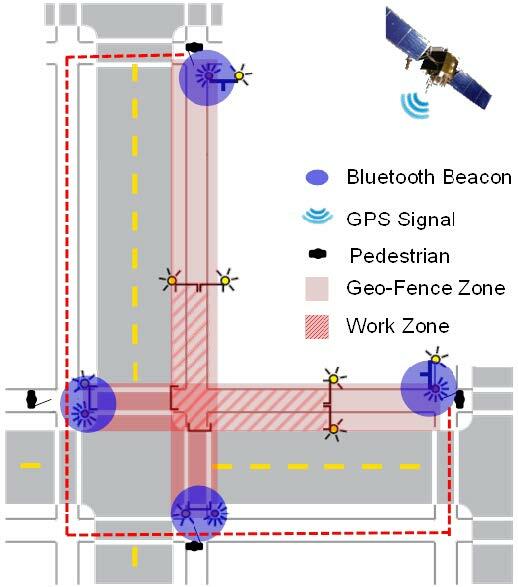 Illustration of Bluetooth beacon placement at decision points around a work zone. Building on previous work to provide geometric and signal timing information to visually impaired pedestrians at signalized intersections, the smartphone-based navigation system alerts users to upcoming work zones and describes how to navigate such intersections safely. The smartphone application uses GPS and Bluetooth technologies to determine a user’s location. Once a work zone is detected, the smartphone vibrates and announces a corresponding audible message. The user can tap the smartphone to repeat the message, if needed. The federal government strongly encourages states to provide either audible warnings or tactile maps at work zones where visually impaired pedestrians are expected to be impacted. Since smartphone use is still limited, the state is also interested in special equipment that could relay the audible warnings at affected work zones. “However, smartphone use is increasing in the general population, as well as with persons with disabilities, and there will likely be a day when it will be rare to not have a smartphone and this tool could meet road agency needs,” Johnson said. Before developing the smartphone application, researchers surveyed 10 visually impaired people about their experiences at work zones and what types of information would be helpful in bypass or routing instructions. The University of Minnesota research team, led by Chen-Fu Liao, tested the smartphone application by attaching four Bluetooth beacons to light posts near a construction site in St. Paul. Additional research is now needed to conduct experiments with visually impaired users and evaluate system reliability and usefulness. *Update 4/29/2014: Check out this story from KSTP on the app.